"The violence comes from the anger. The anger of being poor and never having enough."' I. 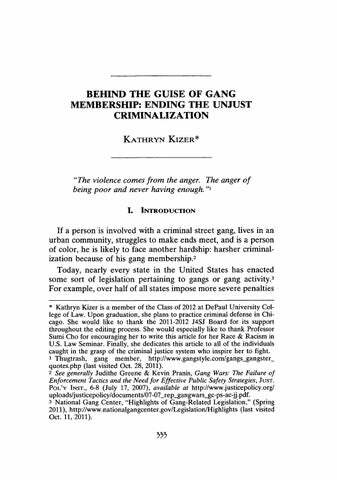 If a person is involved with a criminal street gang, lives in an urban community, struggles to make ends meet, and is a person of color, he is likely to face another hardship: harsher criminal2 ization because of his gang membership. Today, nearly every state in the United States has enacted 3 some sort of legislation pertaining to gangs or gang activity. For example, over half of all states impose more severe penalties * Kathryn Kizer is a member of the Class of 2012 at DePaul University College of Law. Upon graduation, she plans to practice criminal defense in Chicago. She would like to thank the 2011-2012 J4SJ Board for its support throughout the editing process. She would especially like to thank Professor Sumi Cho for encouraging her to write this article for her Race & Racism in U.S. Law Seminar. Finally, she dedicates this article to all of the individuals caught in the grasp of the criminal justice system who inspire her to fight. 1 Thugtrash, gang member, http://www.gangstyle.com/gangs-gangsterquotes.php (last visited Oct. 28, 2011). 2 See generally Judithe Greene & Kevin Pranis, Gang Wars: The Failure of Enforcement Tactics and the Need for Effective Public Safety Strategies, JUST. POL'Y INST., 6-8 (July 17, 2007), available at http://www.justicepolicy.org/ uploads/justicepolicy/documents/07-07_rep-gangwars-gc-ps-ac-jj.pdf. 3 National Gang Center, "Highlights of Gang-Related Legislation," (Spring 2011), http://www.nationalgangcenter.gov/Legislation/Highlights (last visited Oct. 11, 2011). Greene & Pranis, supra note 2, at 6. (discussing the ineffective police suppression tactics implemented in Los Angeles). 7 For example, in the Cook County Public Defender's office in the Chicagoland area, a handful of Assistant Public Defenders have unsuccessfully attempted to bring constitutional challenges to the Illinois gang criminalization law, 720 ILL. COMP STAT. 5/24-1.8 (2011). 8 Robinson v. California, 370 U.S. 660, 666 (1962). 9 See Aaron B. Overton, Note, Federal Gang Laws: A New Tool Against a Growing Threat or Overbroadand Dangerous? 9 RUTGERS RACE & L. REV. doctrines, a more effective avenue is the Eighth Amendment status doctrine, because traditional doctrines permit the criminalization of gang members while the status doctrine better supports sociological realities: people of color who belong to gangs do so because of a long history of hardship and should not be further punished because of this status. Street gang members targeted by anti-gang laws are typically young men of color born into communities with few options for economic survival, protection or role models. Thus, the criminalization of gang members is essentially the criminalization of poor people of color who have had to survive generations of racism and societal marginalization. This proposed platform for challenging anti-gang legislation will therefore demonstrate why a person should not be punished more severely because of his status as a gang member. Nearly all existing research surrounding the criminalization of gang membership focuses on two select constitutional doctrines: overbreadth and vagueness. 10 As a result, theorists tend to focus on why criminalizing gang membership violates a person's First Amendment or Due Process Clause rights.11 For example, some argue that the means used to deal with gang violenceharsher punishment-is not effective and therefore unconstitutional.12 Others claim that the freedom of association necessarily entails one's right to associate with a gang and, therefore, such legislation is unconstitutional. 13 All of these approaches invoke more traditional avenues of constitutional analysis. However, little to no analysis exists that takes an Eighth Amendment approach-the ban on status-based punishment-and invokes sociological research to argue for the eradication of legislation that criminalizes gang membership. 10 See, e.g., Overton, supra note 9. 11 Id. at 418. See, e.g., Myers, supra note 6 at 295-96. 13 Many criminal defense attorneys, for example, have suggested writing this analysis with a focus on the right to association. is the most effective platform for arguing that gang membership should not be criminalized. The disproportionate effect on young men of color, coupled with the history of racism and socioeconomic inequalities that have given rise to gangs, render this criminalization illegal, immoral and harmful to efforts of de-incarceration in the criminal justice system. If activists are seeking to dismantle mass incarceration in the U.S., laws that criminalize gang membership must be eradicated. To accomplish this, a new theoretical approach is necessary. II. WHAT ARE GANGS, WHY Do THEY EXIST, AND How ARE THEY CRIMINALIZED? Various definitions of "gangs" are splattered across penal codes, textbooks, scholarly works and documentaries. Whether lawmakers view their enemy simply as a "gang" or more specifically a "criminal street gang," the targeted group is clear: organized, urban enterprises of young men who engage in criminal activity.18 This understanding of the criminal street gang, however, is flawed. Although legislators across the U.S. have attempted to define gangs for purposes of statutes, ordinances and civil injunctions, no uniform definition exists.19 Moreover, judges and lawyers tend to hold misperceptions about street gangs; they believe these groups are organized, hierarchical, criminally advanced enterprises.20 Malcolm W. Klein, Director of the Social Science Research Institute at the University of Southern California, says 18 Beth Bjerregaard, The Constitutionality of Anti-Gang Legislation, 21 CAMPBELL L. REV. 31, 32 (1998). 19 National Gang Center, BriefReview of Federaland State Definitions of the Terms "Gang," "Gang Crime," and "Gang Member," 1-2 (Dec. 2009). 20 Malcolm W. Klein, Gangs: What Are Street Gangs When They Get to Court?, 31 VAL. U.L. REV. 515, 518 (1997). Id. at 517, 520. See id. at 517. Id. at 518, 520. 105 (2002). 27 Klein, supra note 20, at 516. 29 While law enforcement only report that eight percent of youth (between twelve to twenty-four year-olds) gang members are white, studies (of twelve to sixteen year-olds) actually suggest they account for forty-two percent of young gang members. For nonwhites, law enforcement report that Latinos account for forty-nine percent and blacks make up thirty-seven percent of youth gangs. In actuality, Latinos make up only twenty-four percent while blacks represent twenty-seven percent. This means that law enforcement are targeting nonwhites fifteen times more often than whites. Greene & Pranis, supra note 2, at 36-38. 30 Sara Lynn Van Hofwegen, Note, Unjust and Ineffective: A CriticalLook at California'sSTEP Act, 18 S. CAL. INTERDIS. L.J. 679, 684 (2009). 31 Id. 32 Gary Stewart, Black Codes and Broken Windows: The Legacy of Racial Hegemony in Anti-Gang Civil Injunctions, 107 YALE L.J. 2249, 2273 (1998). 33 Greene & Pranis, supra note 2, at 4. Because anti-gang laws target poor, minority youth in urban communities, these disadvantaged children, and not their white counterparts, are suffering under the laws. 40 This application of the law not only misinterprets the problem it seeks to remedy, but it also causes more hardship in the most vulnerable populations.41 Therefore, in discussing the problems of criminalizing gang membership, it is appropriate to limit the analysis to those who are disproportionately affected by these laws: poor young men of color in urban communities. B.
Caldwell & Fisher-Ogden, supra note 42, at 618. (HBO 2005). Id. Caldwell & Fisher-Ogden, supra note 42, at 618. BASTARDS OF THE PARTY (HBO 2005). Id. at 199. Id. at 34-35. Id. at 34.
note 52, at 150-53, 181.
supra note 42, at 619. Id. at 622-23. Stewart, supra note 32, at 2274.
members themselves are victims of poverty, starvation and a lack of social support. 61 In the face of these hardships, however, lawmakers continue to implement anti-gang laws that exacerbate these problems. C.
City of Chicago v. Morales, 527 U.S. 41, 99 (1999). Bjerregaard, supra note 18, at 32. Van Hofwegen, supra note 30, at 680. Strosnider, supra note 26, at 106. Bjerregaard, supra note 18, at 32. Column, Illinois Law Update, 98 Ill. B.J. 400, 401 (2010). 67 See Illinois Law Update, 98 Ill. B.J. at 401; 720 ILL. COMP. (2010). Morales, 527 U.S. at 46-47. Id. at 49. BALLENTINE'S LAW DICTIONARY (2010); Hofwegen, supra note 30, at 680. Myers, supra note 6, at 286-87. Id. at 291. Morales, 527 U.S. at 54; Stewart, supra note 32, at 2258.
illegal acts likewise marginalizes disadvantaged people, but 75 under the guise of gang membership. Overall, the common thread of these anti-gang laws is their focus on increasing punishment for anyone who affiliates with a gang. But these massive deployments of police power against gang members fail to make the streets safer and actually cause more harm than good to the communities they purport to help.76 D.
Hofwegen, supra note 30, at 690. In reality, they receive harsher treatment in the criminal justice system because of skin color, socioeconomic status and the pervasive confusion that exists among judicial officers, law enforcement, and the public as to how the U.S. should address gang problems. Therefore, because of the criminal justice system's continual failure to proportionately and effectively address gangs, an entirely new discourse is necessary. IH. Opponents of anti-gang legislation primarily use two constitutional approaches to challenge these laws: vagueness and overbreadth doctrines. 85 However, appellate courts have historically upheld anti-gang laws in the face of these constitutional challenges. 86 Before proposing a new method of challenging these laws, this critique will first examine why these traditional doctrines fail to eradicate anti-gang laws. A. A common shortcoming of both the vagueness and overbreadth doctrines is that constitutional challenges are rooted in a showing of explicitly protected conduct. Like all traditional approaches, these doctrines focus on the ways laws infringe upon a person's conduct rather than his identity.98 Even if a gang member were to engage in a constitutionally protected activity, the protection from harsher punishment dissolves the moment he stops this activity. If one day he engages in his freedom to attend a gang meeting, his protections end when he leaves the meeting and returns home that night. He is still a gang member. When he wakes in the morning, he is still a gang member. If he goes to school, he is still a gang member. Gang membership is what a person is, not what he does. And most importantly, what gang members do is often already deemed criminal-these laws simply impose greater consequences because of who they are. This is why a new constitutional platform is necessary-one that reflects the sociological reality that gang membership should not be a basis for harsher punishment because it is a guise for one's disenfranchised social status. IV. principle emerged from this landmark decision: "[T]here are instances in which the state, despite its legitimate interest in suppressing and correcting a socially harmful condition, may not without violating standards of decency impose criminal sanctions. "109 Before turning to the utility of the status doctrine in eradicating anti-gang laws, an examination of the tangled case law surrounding the status doctrine is warranted. B. The landscape of Eighth Amendment status doctrine is messy, unclear and incomplete. 110 This critique argues for the need for Ingraham v. Wright, 430 U.S. 651, 667 (1977). Robinson, 370 U.S. at 666. Robinson, 370 U.S. at 667 (emphasis added). be innocent to be protected. 34 Other opinions do not address the nature of the criminalized conduct at all.135 A common theme among these cases, however, is that there is typically some underlying problem that lawmakers are attempting to remedy, such as drug addiction or homelessness. 136 The governmental interest stems from preventing certain conduct related to the status, such as homeless individuals sleeping outside and consequently blocking public ways. 137 Yet beyond this thread, there is little continuity in the case law interpreting the status doctrine. Despite the valuable principles underlying the status doctrine, "Robinson raises many more questions than it answers."' 138 Thus, scholars are left to interpret the status doctrine without the aid of clear interpretive decisions. Yet one foundational principle should guide one's invocation of the status doctrine: it 39 is cruel and unusual to punish people for who they are. 1 C.
Gang membership should be deemed a "status"
Pottinger, 810 F. Supp. at 1561-65.
ing of Robinson, they should return to its underlying principle of decency). 140 See Powell, 392 U.S. at 533-34. See id. Robinson, 370 U.S. at 662. 720 ILL. COMP. STAT. 5/24-1 (2011). See 720 ILL. COMP. STAT. 5/24-1.8 (2011). See 730 ILL. COMP. STAT. 5/5-4.5-55 (2009). Id. See id. at 5/5-4.5-35. 92 (The New Press 2010). so when such a decision is supported by probable cause. L. Ruv. 2464, 2519 (2004). critique because it shows that courts invoke this doctrine sparingly. 170 In other words, courts rarely use status to intervene. To be clear, this expansion of the status doctrine would constitute a more extreme constitutional stance than courts have held in the past. 171 However, in light of the extensive sociological research showing that nonwhites born into urban poverty often face few options for legitimate survival, fairness demands a shift away from harsher punishment. Fears of under-using police power or over-using the courts must give way to the greater need for ending this unjust criminalization. D.
Rather than employing punitive, ineffective measures in an attempt to shake the gang ties out of young men, lawmakers should turn their attention to more successful, humane approaches that stay true to the central decency principle underlying the status doctrine. In New York City, for example, officials have implemented intervention tactics that have proven very effective.172 The intervention programs include job training and employment, recreational and after-school activities and mentoring.173 Since the implementation of these interventionist tactics, crimes that are gang-related have declined and the city "has made a significant dent in gang violence."' 174 Approaches like this reveal that lawmakers should end the nationwide war on gangs through police suppression tactics and reallocate these resources for intervention. DePaul Journal for Social Justice V.
Many individuals find themselves on the fringes of society because of various handicaps-racial discrimination, extreme poverty, violence in their community and a lack of institutions to insulate them from illegal temptations. Today, lawmakers are compounding the suffering of these populations by punishing them more severely for joining gangs. As a result, the gaps are continuing to widen between white and non-white, rich and poor. The solution to this injustice is to do away with harsher punishments on the basis of gang membership. But traditional approaches are not enough. An entirely new discourse is needed-one that takes into account the human suffering and ineffectiveness underlying this criminalization. Until laws that further handicap people based on status are eradicated, the criminal justice system will continue to be the bearer of injustice in America.